The British High Commission has urged Government to team up with the business sector to tackle corruption. 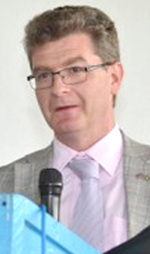 Speaking at Monday’s Annual General Meeting of the Georgetown Chamber of Commerce and Industry (GCCI), High Commissioner Greg Quinn explained that alongside legislation there are also issues around perceptions of corruption and the ease of doing business. In recent years, Guyana has seen a steady improvement in the Transparency International (TI) Corruptions Perception Index. Consecutive governments have been dogged by accusations of corruption and of doing little to halt it. According to Quinn, the TI figures put Guyana in joint 93rd position (out of 180 countries measured) with the Gambia, Kosovo, Macedonia, Mongolia and Panama. Quinn admitted that the Corruptions Perceptions Index evokes strong feelings among the business community. He urged that the Government, in cooperation with the private sector, work together to continue to address this issue and to tackle corruption, wherever it is found, head on. According to the High Commissioner, this also feeds into the World Bank’s Ease of Doing Business scores. According to the envoy, tellingly, the biggest drop from the previous year’s score was in the area of ‘Getting Electricity’. “Something I am sure many of you in this room will agree with. Let me also take the opportunity to note the recent IDB report on ‘Constraints Affecting Guyana’s Private Sector: Survey Results’ which notes that electricity, high taxes and corruption are ranked the most serious obstacles to local businesses. He said that entrepreneurship is the driver of the private sector. He said that the GCCI and its members have a role to play in driving forward the economy of Guyana. “The public sector has a role to play, but ultimately the success of an economy is very much dependent on how well the private sector performs. However, the best way of ensuring this is with a strong partnership between the public and private sector. Both must come together and work together for the benefit of Guyana. Quinn stressed that Chambers of Commerce have an important role to play.